The North Pacific Ocean has seen exceptional levels of tropical cyclone activity this season as reported in this blog over the last few months. By the end of November it is usual to see the season drawing to a close in most parts of the northern hemisphere. However, the unusual conditions in the eastern North Pacific due to the ongoing El Niño has resulted in a couple of late season tropical cyclones. Tropical Storm Rick was relatively weak, but has been immediately followed by Sandra which rapidly strengthened into a category 4 hurricane with winds near 145 mph and a central pressure of 935 mb. 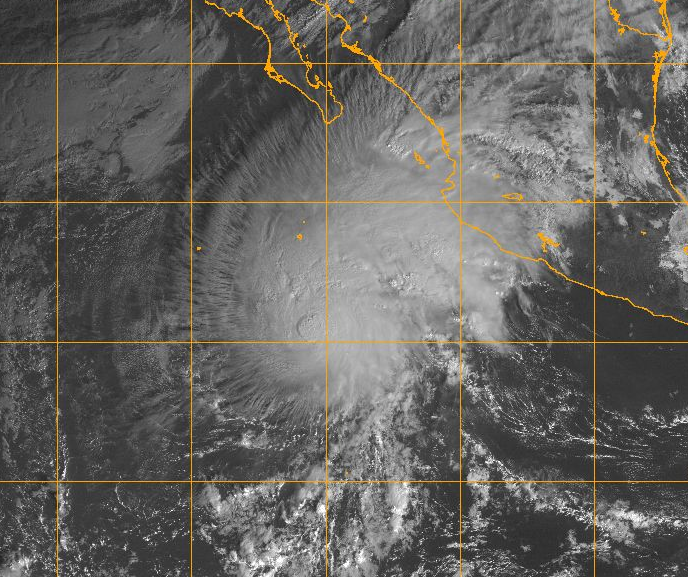 The last time a hurricane formed so late in the season in the eastern North Pacific was back in 1983 when Hurricane Winnie developed in December. However, Sandra is much stronger than Winnie and has become the strongest hurricane on record to have formed in the region so late in the season. It is barely a month since Hurricane Patricia came ashore over Mexico as a category 5 hurricane producing a narrow swathe of severe damage to mostly rural areas, but avoiding major cities. Sandra is forecast to make landfall on Saturday, but unlike Patricia is expected to rapidly weaken as it approaches the coast. Thus severe impacts from wind are not expected, although the storm could still produce a lot of heavy rain as it comes ashore. If Sandra crosses the coast as a tropical storm it will be the latest in the year that a landfall has ever been recorded over Mexico. Hurricane Sandra has added to an already exceptionally active tropical cyclone season seen across the northern hemisphere (particularly the Pacific Ocean). This high activity is primarily as a result of the strong El Niño which has existed for the last few months. This has raised sea surface temperatures well above normal in parts of the Pacific Ocean and also made atmospheric conditions conducive to development of frequent and strong tropical cyclones. Across the northern hemisphere as a whole there have now been 26 tropical cyclones which have attained category 4 or 5 on the Saffir-Simpson Hurricane Wind Scale (one-minute averaged winds of 130 mph or more). This is eight more than the previous record set in 2004. In the eastern North Pacific (east of the Dateline) there have been 10 hurricanes reaching this intensity which is two more than the previous record set in 1997. It must be noted that records relate to the era of reliable satellite data coverage from the 1960s and 1970s onwards. Official warnings for the latest tropical cyclones in the East Pacific are produced by the US National Hurricane Center. The Met Office routinely supplies predictions of cyclone tracks from its global forecast model to regional meteorological centres worldwide, which are used along with guidance from other models in the production of forecasts and guidance. We also provide updates on current tropical storms via @metofficestorms on Twitter. This entry was posted in Met Office News and tagged East Pacific, eastern pacific, El Nino, gales, hurricane, Met Office, Pacific Ocean, Pacific typhoon records, tropical cyclone, tropical storm, weather, wind. Bookmark the permalink. This is utter garbage. Sandra was never a Cat 4 hurricane. Data shows it was at most Cat 2 and earlier today it was rapidly losing power long before reaching land. More propaganda from the Met Office for the Paris jamboree. Hurricane Sandra was classified as a Cat 4 hurricane by the National Hurricane Center on Thursday http://www.nhc.noaa.gov/archive/2015/ep22/ep222015.public.011.shtml? Just because it was classified a Cat 4 hurricane by NHC does not mean that this category was justified. Their classification was based on modelled results which are not supported by empirical data. Empirical data indicates that Sandra probably reached Cat 3 for all of 3 hours before losing power rapidly, but even that was long before making landfall.